Review Boston Advance Cleaner I have used this product for a good while and have always been extremely happy with it. Ordering on-line could not be easier and I was amazed to take delivery the following day! I can not think of any other company to give such good service. Many thanks to Vision direct. Boston Advance Cleaner Great contact lens cleaner! It removes deposits quickly and makes my lenses super comfortable! Boston Advance Cleaner It's very easy to clean your lenses with Boston Advance and done quickly, too. Recommendable! 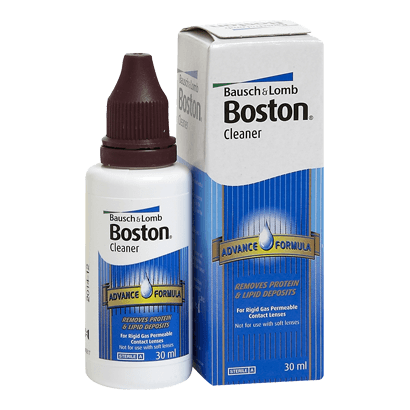 Boston Advance Cleaner from Bausch and Lomb makes it easier than ever to keep gas permeable lenses clean and clear throughout the day. Not only are clean lenses healthier for your eyes, but they provide an extra level of comfort as long as you are wearing your lenses. The Boston Advance Cleaner has been designed to be part one of a two-step cleaning process. Part two uses the Conditioning Solution, but the Advance Cleaner can be used as a standalone product. The clever tint in the cleaning solution makes it even easier to see and to use. You can easily make sure that every single millimetre of the lens has been covered with solution, and properly cleaned.